Parking Fee: The Disneyland Resort Hotels - Disney's Paradise Pier Hotel and Disneyland Hotel and Disney's Grand Californian Hotel and Spa, charge a daily parking of fee of $25.00. The parking fee is charged per room per night and will be paid upon time of check out. This is charged to the Guest by the hotel directly and is in addition to the purchase of the package. One Magic Morning entry into Fantasyland and Tomorrowland in Disneyland Park one hour early on a Tuesday, Thursday or Saturday; valid with Disneyland Resort Park Hopper souvenir tickets of 3-Days or longer. 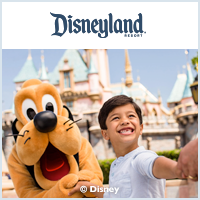 Disney’s Southern California Dreams Vacation Package combines a minimum 3-night stay at the Disneyland Resort PLUS one or more additional destinations including San Diego, Los Angeles, or Orange County. Minimum 3 night stay in any Disneyland Resort (Disney's Grand Californian Hotel & Spa , Disney's Paradise Pier Hotel or the Disneyland Hotel)or Good Neighbor hotel. Your stay in any Disneyland Resort (Disney's Grand Californian Hotel & Spa , Disney's Paradise Pier Hotel or the Disneyland Hotel) or Good Neighbor hotel. Disneyland Resort Hotel recreational facilities and Fitness Center access(Available with Disneyland Resort Hotels Only). *The Disney Rewards Visa Dream Vacation Package must be paid for with your Disney Visa card. Valid most nights through May 23, 2019!